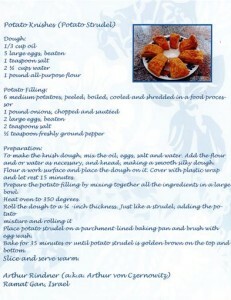 The recipe as published in The Bukovina Cookbook. Usually we try to make recipes out of our collection of historic cookbooks found in the Leo Baeck Institute’s library and archives. However, we have branched out a bit recently. 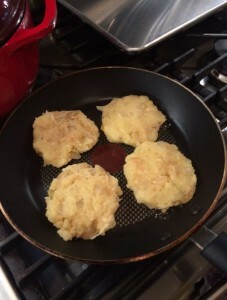 We made one recipe from In Memory’s Kitchen, which documents recipes elderly women shared in the Theresienstadt Ghetto when, without food or even basic nutrition, they would share recipes as a way to connect with their lives before the Shoah. Now we decided to branch out a second time. Online and readily available to everyone with internet access is a four-volume publication called The Bukovina Cookbook. It is described as “A collection of authentic recipes submitted by former Bukoviners and descendants of Bukoviners,” and was compiled by Merle Kastner in 2010. These are actually recipes of Jewish Bukoviners who are now scattered around the world. Approximately 2/3 of the population of Jews in Bukovina perished; 1/3 survived. A large number fled to Israel after the war, but there are recipes submitted by people in the United States, Canada, South America, and elsewhere. We were interested in these recipes because, on the one hand, they were so Viennese. Czernowitz, which had a large Jewish population, was sometimes called a smaller Vienna. It was an important city of the Austrian Empire until it passed to Romania at the end of 1918. At the same time, small regional differences seem to have existed. In case the recipe didn’t turn out, my friend was preparing a very nice dinner for her friends, so we wouldn’t be disappointed. And both her and her boyfriend love to cook. They can make anything delicious. So I felt in good hands. For example, when I got to their home they had already measured everything out and were prepared to go. I’m not sure I would win points for my organizational skills, myself. And so we began. We started with the potato filling. After preparing the six potatoes, we shredded them with a hand-held appliance. Once the potatoes were shredded, we added in the pound of onions (basically two medium sized onions), the beaten eggs, and the salt and pepper. If I were to do this again, I would add more onion and spices to the potato mixture—it proved rather bland for my tastes. We now followed directions for the dough for the strudel. We mixed everything together as directed, and then kneaded it on a floured surface. I don’t know what went wrong here. Possibilities include a mistake in the recipe—this seemed like way too much flour from the get go. 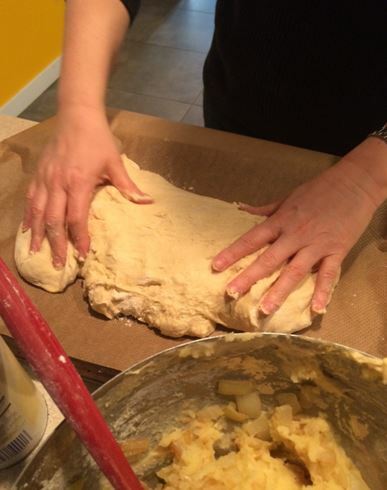 We became increasingly alarmed as we tried to conquer the dough as we kneaded it. It was just too much dough….just too much! We did as the recipe said, covering the dough in plastic and letting it rest 15 minutes. 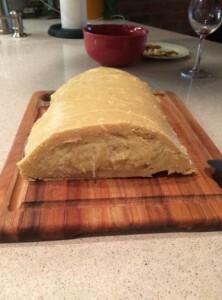 Then we took it out and, as the oven pre-heated to 350 degrees, we rolled the dough out to a ¼ inch thickness and proceeded to add the potato mixture. Talk about thick! We used the parchment paper underneath to wrap the potato mixture inside, as the dough was all sticky and bulky. We couldn’t really press it down to just a ¼ inch thick without it kind of springing back. Maybe we were supposed to work more on making it thinner than we did? I just don’t know. It seemed like it shouldn’t be this hard. In addition, we had so much potato filling! We couldn’t wrap the dough around it, and in the end used only half of the potato filling. All the measurements seemed way off. We weren’t hopeful at this point, but proceeded. We brushed it with an egg wash, using just a few broken eggs mixed with water and proceed to put the whole giant thing in the oven. We baked it the 35 minutes given in the recipe and removed it. We took it out, we sliced it while still warm, and took a taste. The crust was too thick and still doughy, and the potato filling was simply not spicy enough. Even more salt would have been helpful, and more onion. Luckily, my friend had prepared a big meal and we ate it smothered in gravy, which helped some. I don’t know exactly what went wrong. I think the measurements are somewhat off. On the other hand, I like spicy food and lots of Central European cuisine is not meant to be spicy. So that has to be taken into account (for example, my favorite food is Indian—the spicier the better!) I don’t blame Mr. Rindner. Between how ingredients are measured and taste buds change over geography and time, between cooking as it once was and as it now is today, there are lots of variables that could have affected it. 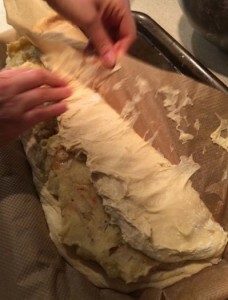 My advice: Go to the store and purchase filo dough instead of making the crust from scratch. When you make the potato filling half the recipe but make it spicier. Add extra onion, salt, pepper and maybe something else you might want to try and think would be good. Finally, as a savory dish, even if it had turned out tastier it is always good to have gravy. It can serve as a kind of substitute for boiled or mashed potatoes. We actually had so much potato filling that almost half was leftover. 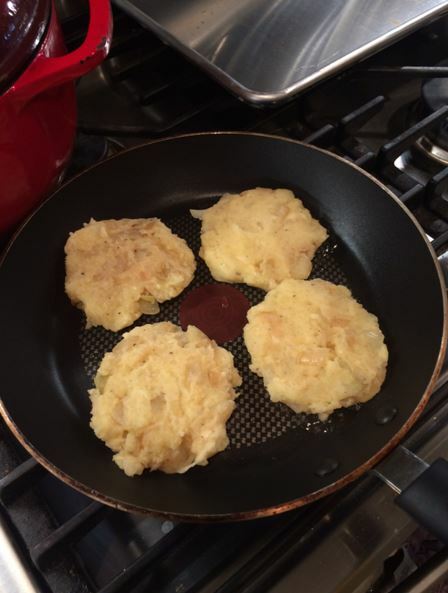 And this proved to be the best part of the recipe—we took the filling, patted it out, and made latkes! The latkes were pretty good. They could have used a bit more onion, salt, and pepper, but it’s easy enough to add the last two. 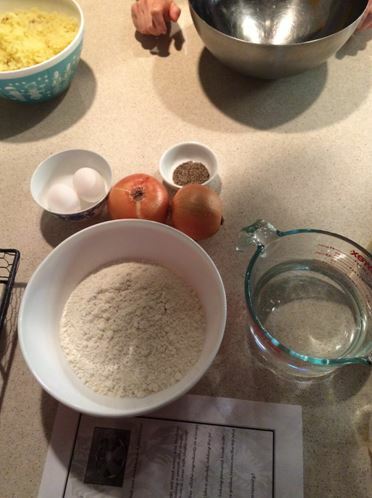 So if anything else, we got a basic latke recipe.